A great sounding, fully-featured setup. ...perhaps too many for some! 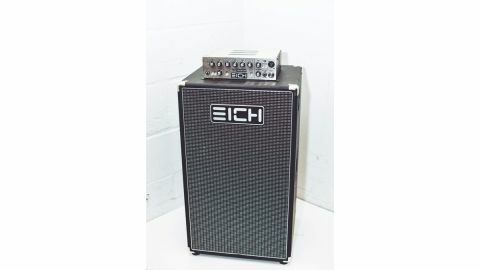 Eich gear is becoming increasingly visible at venues and concert halls around the globe - which would indicate that the bass-playing public are taking notice of the brand and liking what they hear. Tucked away in our command bunker, we put their T-1000 amp and 1210S-8 cab through their paces. The T-1000 is compact but fully featured; very little has been omitted, if at all. Magnetic fixing strips ‘connect’ the amp to the top of the cab, preventing it from falling off, while a disc on the side handle allows the player to loop their playing cable so that it can’t be yanked out of the amp by accident. With a four-band EQ, bass and high boost switches, a compressor with a selectable attack time, a Taste control for extra low-end punch, attack or mid presence, a headphone out and Aux In for private practice, you’re getting a lot of usable features for your money. With so many switching options, connection possibilities and features, we don’t have space to go into every detail - but suffice to say, this appears to be a very flexible amp. The slim 1210S-8 cabinet has a classic look. Fitted with 12” and 10” ceramic speakers, its performance is enhanced with an adjustable three-way tweeter system, enabling it to perform under significant sound pressure levels without unwanted distortion. Rear venting at the base of the cab improves the bass response, while a pair of carry handles on either side of the cabinet make moving the unit around very easy. Tested with both active and passive basses, the results are very impressive. As we said, the cabinet features a three-way horn/tweeter arrangement; to make the most of this, Eich has included a three-way control for each unit. Each has an off setting, a ‘halfway’ operational setting and soft/hard/bright settings. Using an active bass with flat EQ, each setting incurs a very noticeable change in the sonic delivery from the cabinet. Spend some time getting used to all the amp and cabinet features and experiment with how they interact, otherwise you may find yourself EQ-ing your bass via its preamp, the amp and the cabinet - potential overkill. We found that the amp’s boost buttons worked best in conjunction with the cabinet controls. This combination puts in a pleasingly deep bass performance, so don’t assume that this is only for ‘hi-fi’ bassists - there’s plenty of power on tap. Slap, tapping and percussive styles are conveyed with precision, crispness and finesse, but if a meaty rock tone is your requirement, this is achievable without too much effort. With strong fundamentals across a broad frequency range, passive basses sound thick, rounded and punchy. The speaker configuration is a real winner, offering smoothly rounded tones alongside the projection and clarity that makes this pairing such an impressive setup. There is very little that this package can’t address, and with plenty of extension facilities built in, the setup is future-proofed. We’re hard pressed to fault either unit, and bear in mind that with so many functions and facilities on offer, this review only scrapes the surface when it comes to this system’s full capabilities. At this price, you’d expect a few bells and whistles, of course. We suggest you try them out for yourself at your earliest convenience.